About: Aveda was founded in 1978 specifically for beauty industry professionals, creating products from plants and flowers such as skincare, haircare, make up and perfume. They now have 7,000 professional hair salons and spas in 24 countries worldwide. 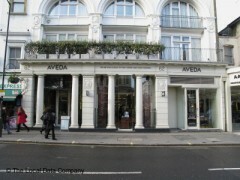 Aveda Lifestyle Store offers a wide range of products and services. There is a hair and beauty salon, plus a retail area selling a full range of hair and beauty products. They also have a florist.